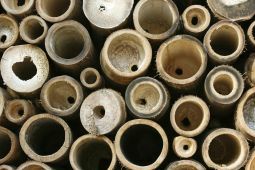 BAMBOO: a natural composite material longitudinally reinforced by strong fibers. LIGHT: In wood the strongest fibres are packed in the centre of the trunk, however in bamboo the stems are full of cavities and the strongest fibres are distributed most densely in the outer surface region. STIFF: As a consequence the most stable fibre structures in bamboo are most dense in regions of greatest longitudinal stress. Wood bends relatively easily but bamboo does not. Bamboo is therefore an ideal material for bike construction where stiffness and strength to weight ratios are important.